Yesterday, Texas Attorney General Ken Paxton issued an opinion stating that participating in daily fantasy football websites is illegal gambling in Texas. The opinion specifically states that participating in daily fantasy sports leagues is illegal gambling under section 47.02 of the Texas Penal Code. Section 47.02 of the Texas Penal Code states that a person commits an offense if he or she makes a bet on the partial or final result of a game or contest or on the performance of a participant in a game or contest. Under 47.02 of the Texas Penal Code, gambling is a Class C misdemeanor offense, wherein offenders could face a fine of up to $500.00. Gambling under Section 47.02 of the Texas Penal Code is a fine-only offense that does not involve jail time as a punishment. Can I keep playing daily fantasy sports? It’s up to you. 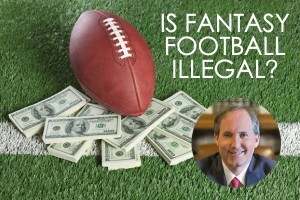 If you continue to play daily fantasy sports in Texas, you would be participating in illegal gambling as the law is interpreted by Attorney General Ken Paxton. Again, according to the attorney general, participating in daily fantasy football league sites constitutes a Class c misdemeanor. Opponents of the AG’s opinion argue that daily fantasy sports involves skill to really win. Mark Cuban, owner of the Dallas Mavericks, is one of the outspoken people who disagrees with the Paxton opinion. He believes that just about everything in life and business involves chance and could be considered gambling as Paxton defines it. What is important to remember though is that the attorney general cannot and will not be responsible for the actual investigation or prosecution of these cases. Local law enforcement and local district attorneys would be the responsible agencies for enforcing this law. Investigation of these cases would have to be tedious and would require a significant amount of resources in order to prosecute the lowest level of offense under Texas law. Whether the State would go to the extent needed to prove these types of gambling charges beyond a reasonable doubt is yet to be seen. The law does allow a defense to prosecution for gambling if the person engages in gambling in a private place, no person receives any economic benefit other than personal winnings; and except for the advantage of skill or luck, the risks of losing and the chances of winning are the same for all participants. What does this Fantasy Sports AG opinion mean for the average Texan? The opinion means that, according to the State’s highest-ranking attorney, participating in daily fantasy sports leagues is illegal gambling. Now, it’s up to each local jurisdiction’s law enforcement agencies, prosecutors and courts to decide if prosecuting these cases is a priority or not. Law enforcement uses discretion on a daily basis as to what crimes and actions they should focus the bulk of their enforcement actions on. It’s unknown at this time if or whether law enforcement will spend the resources necessary to prosecute these cases. Hopefully, if you choose to continue to play daily fantasy football, you are good at it and can cover your potential fines. We’ll have to wait and see which, if any, jurisdictions choose to enforce this opinion. Based on the resources it would take, I seriously doubt that we’ll see any citations written for this. Good luck out there!